Today I made a wonderful discovery and am thrilled to bits about it! I have written before about my husband’s pasta fixation! I realized today that the son follows suit! My baby loves pasta! Please excuse my excitement as these proclamations come from the mother of an extremely finicky eater! Making this also turned out to be an educational experience for Hari as he asked me the names of the vegetables and the pasta shape. He liked the colours and textures in his lunch and with much curiosity asked me the names of all the ingredients in this dish that crossed his tiny hands. 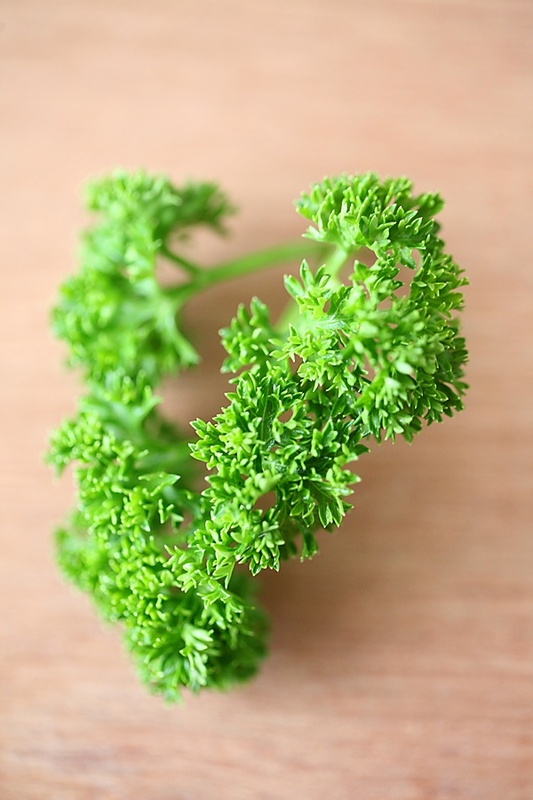 And then when I was shooting trying to get the perfect horizontal shot, Hari came running and reached out for the parsley on the table, which for me turned out to be the “perfect” shot! Realizing that one day he will be grown up and won't resort to such antics makes me treasure such moments even more! What adds an interesting dimension to this pasta is the fresh cheese. Its a breeze to make it at home and fresh is always best! Ofcourse, if you wish you always have the option of using store bought cheese. But do give this a try to experience the simplicity and taste. I love grilling and roasting vegetables in the oven and often find myself doing it with every other meal I that I cook! The burst of colours from the vegetables and flavours emanating from the herbs makes me happy! I try to capture the essence of every step and by so doing, I happened to observe the footprints of the vegetables left behind on the baking parchment. The impressions left by these vegetables also happened to make a pretty picture. 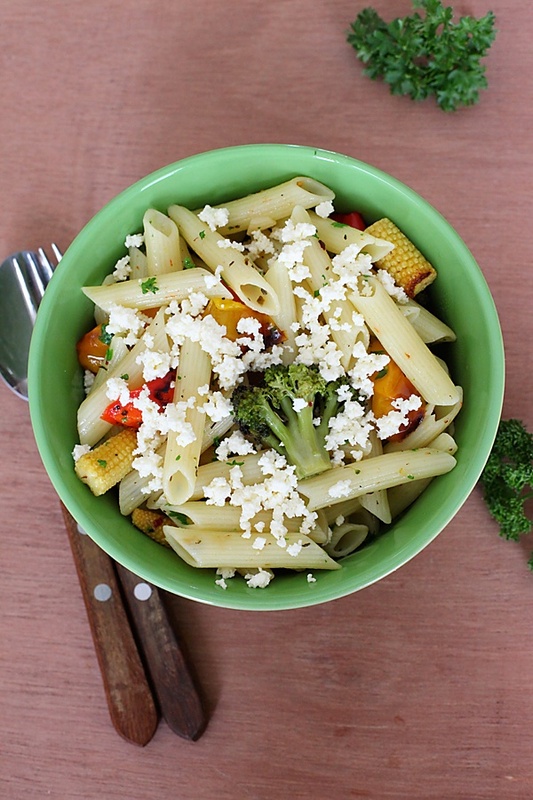 The flavour of the roasted vegetables, the mealiness of the pasta and the softness of the cheese, all come together in this bowl to create a one pot meal that is fresh, healthy and full of relish in every bite. 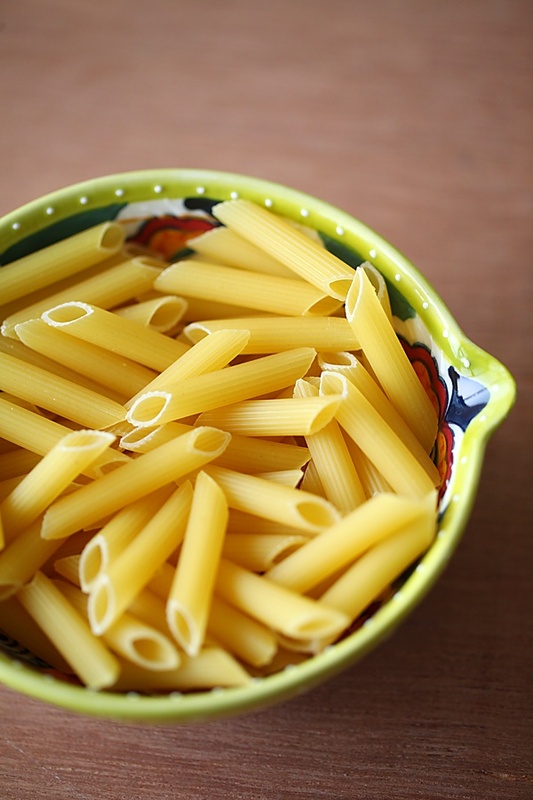 You can use wholewheat pasta or any other pasta of your choice. You can also use any fresh seasonal vegetables here and use vegan cheese to substitute the dairy cheese for a vegan friendly version. Pre heat your oven to 200 C/400F. Line a large baking tray with greaseproof paper or baking parchment. * Cooking time depends on individual ovens. My convection oven takes 20 minutes while my OTG takes more time. In a large saucepan, bring the water to a boil, add salt, oil and pasta and cook until done, according to package instructions. In a sauce pan, bring the milk to the boil. Add the yogurt or the lime juice and cook for a minute or two, until the milk solids separate from the whey. Turn off the heat and pour the contents over a strainer. Allow the water to drain completely, about 8 to 10 minutes and you have fresh cheese ready! *You might have to use a little more, if the milk solids don’t separate. In a wok, heat the oil over a medium flame. Put in the paprika and the parsley and stir for a few seconds. Toss in the pasta and roasted vegetables and mix well. Serve the pasta in bowls or plates with crumbled fresh cheese sprinkled over it. Absolutely loved the dish, will have to try this ASAP 🙂 and the pix taken are soo tempting. Just a suggestion. While makin the cheese crumble, Pls donot throw away the whey. Its an excellent source of protein nd calcium, instead keep it in the fridge and use it to make the chapati dough or paratha dough next day. Refreshing,Healthy and lite Pasta dish. Beautiful pictures. 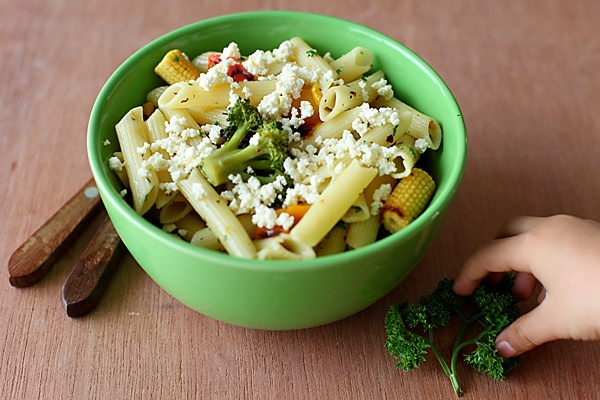 I loved reading mom's and kids educational experience while cooking this Pasta dish. Oozing natural flavors from veggies are lost on parchment paper, Do you think it will be good idea to directly place veggies on baking dish and later swirl little cooked pasta to pick that flavor? 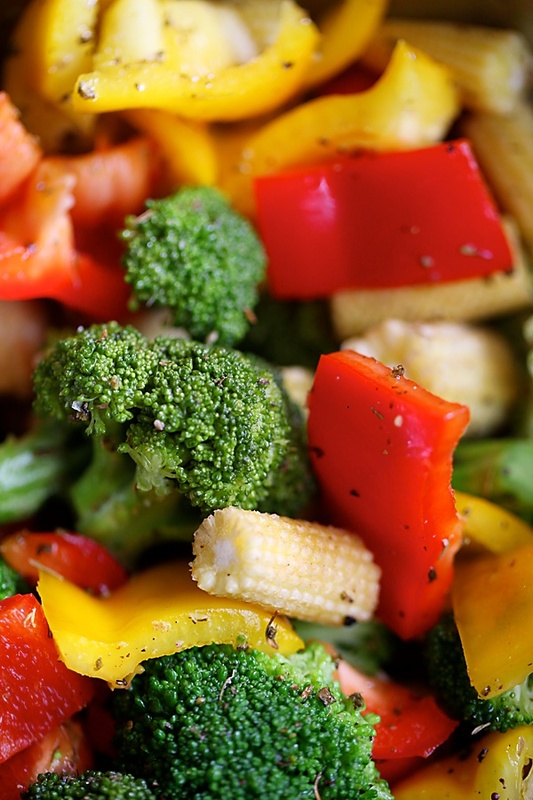 Also Why not gently spray veggies with oil for better roasting/grilling flavor? Is fresh crumbled cheese and Paneer same? Disha: Thank you for the tip. The whey water also makes the dough softer and tastier. 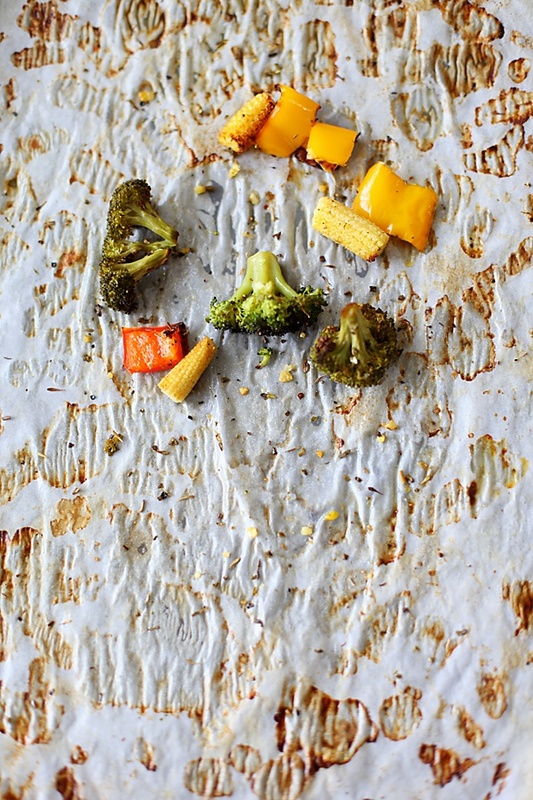 Sattvik: I use a parchment paper as it is easier to clean the tray but I do roast vegetables directly on the tray as well. I don't find that natural flavours are lost with both the methods, it definitely doesnt make a huge difference. Since I really like to roast my vegetables well, and stop just before they are charred, those are nothing but impressions from one side of the vegetables, I assure you! I can have incredible pasta with those roasted veggies even everyday,beautifully done..
My daughter is also a Great pasta fan! When she was a baby I usually would just mash vegetables to make a quick sauce and add it to the pasta. Now ofcourse she can eat whole vegetables. I like how versatile pasta is and can make anything into a meal! That looks great, I love feta cheese, makes pasta even more yummy !!! I have said it before and I can't help but say it again – your site is such a feel-good happy place. Whenever I am feeling blue, I visit your site and the wonderful recipes and the beautiful photographs always make me feel better.I call it one of my comfort blogs :). I am planning to make this pasta tonight for my husband who has a mild fever and is milking it for all its worth :). Hopefully he will love it. Please keep up the wonderful work. Lovely anu. Loved the pics and the presentation. How old is hari now? Priya: My husband can have this kind of a pasta everyday too! Chinmayie:True… it is a versatile and comfort food! Poornima: Thanks for saying it again! 🙂 Making this a comforting place is definitely on my priority and a feedback such as yours makes me feel I'm achieving my objectives. Hope your husband loved this! This is a perfect light and refreshing dish. I love it. Hey.. Google just accidentally got me to your site while searching for a cheesecake recipe.. and what a find! am glad i stepped in and have promptly bookmarked it to the favorites. Indrani: Thank you for your kind words. 1) I have a micorwave without convection but with grill…will that do? Or does this recipe work well only in the oven. I grilled the veggies today and felt that I had to cook it a little more. onestoryaday: Salt is always subjective so I write the amount that I put in and to taste in all my recipes. I have no idea what gave you the impression that I use both, I dont know! If you read my FAQ, you will know that I'm vehemently opposed to using a microwave. I would any day suggest you to go for an oven OTG or built-in (I have both). But, again that's my opinion. I was reading the Vegetarian chili post, a link in which brought me to this post.. It is such a cool idea to link different posts like this! 🙂 I have a question regarding the Whey that is left out after making paneer. Can we use the whey in anyway or is it unusable? Thanks. Ashwini: I don't know how I missed answering this! Sorry about the lapse. You can use the whey in many ways. It is very nutritious and can be used to make paneer or chenna, used instead of water to make dough and can also be used to make soups and stews.